Bishop Walter Mixa of Augsburg, Germany, stepped down amid allegations of hitting children and misusing funds. Bishop asks forgiveness from "all those I have saddened"
(CNN) -- The pope has accepted the resignation of a German bishop who had offered to step down last month after he was accused of hitting children in his care and misusing money donated to an orphanage. 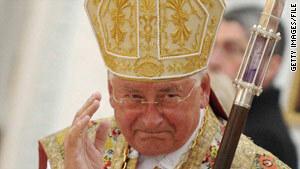 A statement from the Vatican on Saturday confirmed the resignation of Bishop Walter Mixa of Augsburg. In accepting the resignation, the Vatican cited a section of canon law that allows a member of the clergy to resign "because of illness or some other grave reason" or if he has "become unsuited for the fulfillment of his office." In a brief April 22 statement, Mixa asked forgiveness from those "to whom I have done an injustice and all those I have saddened." The Catholic Church across Europe has been reeling from accusations of physical and sexual abuse by clergy members, and Mixa is the latest in a string of bishops to resign.